Enkay's Airway Buffing Wheels are made up of 16 plys (1/2" thick)of cotten mounted to a steel ring center in a specific way to create pleates in the cotton surface. The pleates allow the buffing wheel to run cooler and in turn keep the surface being polished cooler. This allows you to polish longer than a standard buff. 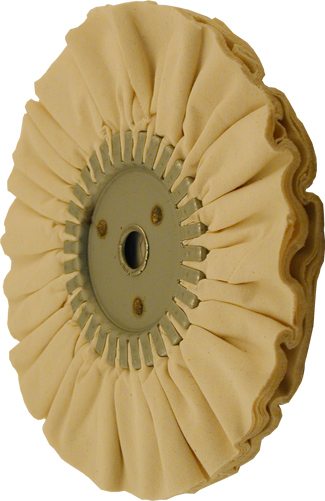 Airway buffs are generally used in place of the standard spiral sewn wheels. The stifness of these Airway buffs are similar to the spiral sewn wheels. Airway Buffing Wheels should not exceed 3,600 RPM. All Enkay Buffing Wheels must be used with polishing compound.